Howdy there farmer! The name’s Marvin. I’m the fastest Olympic Marmot in the Rocky Mountains! In fact, I’m known as a track and field legend ‘round here! Check it out! 1. My secret is a strict diet of fruits and veggies. That’s how I ALWAYS win...well, except for today. Today I was beat! Beat by a beautiful little Marmot named Helen. 2. Helen runs the Styrofoam Mill here. Being a shy and quiet Styrofoam Artist, I NEVER suspected SHE would be able to STEAL the win from a fine athlete like myself. 3. I also never expected her to steal my heart so fast either. We fell in love INSTANTLY. Soon after we met, we were married in a beautiful flower meadow on a fine summer’s day. 4. Before long, we adopted a baby olympic marmot named Maddie. Maddie was great at making Styrofoam art with her mom but not so good at the running thing; her legs were TOO short! 1. Maddie’s dream was to be a track and field star, like her Ma and Pa but race after race no matter what she ate for energy. She kept losing! Poor Maddie, she tried so hard! 2. Even the Marmots at school made fun of Maddie’s short legs. Her dream was starting to drift away like a firefly in the wind. The taste of sweet victory felt impossible. 4. Her shoes were just too heavy for her little legs to carry? Maddie had to find out, so she made herself some shoes with Styrofoam and some things she found on a nearby beach. 1. After having a healthy home made meal, Maddie put on her newly crafted state-of-the-art-light-as-air-styrofoam-shoes and set off to compete in her next race and guess what? 2. THIS time, Maddie won FIRST place! At last, it was her moment of glory, her time to shine. In fact, from then on, Maddie and her new shoes went on to win hundreds of races! 3. When she wasn’t winning races, she was designing clothing and footwear for other marmots. Maddie was the first female marmot entrepreneur to grace the Rocky Mountains. 4. She was also proof that with a little bit of grit and determination ANYTHING is possible…even if the odds are against you! Hmmm…maybe Maddie can even inspire YOU! Can I keep the habitat if I complete only one set of the steps? Neko, check the link to the right - Marmots in Motion. 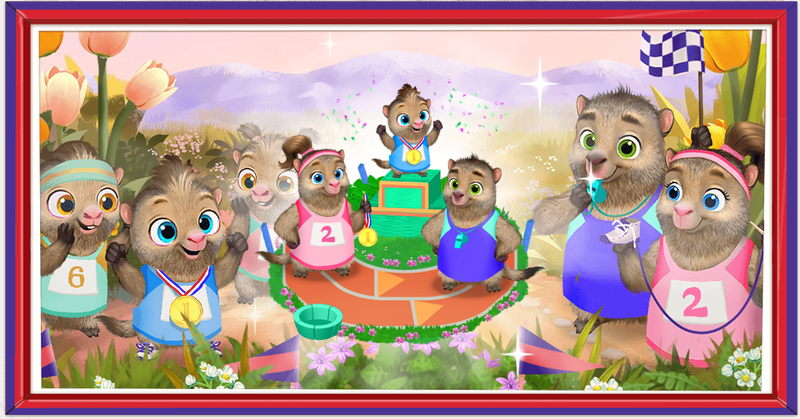 As you complete your level steps, you will get the Olympic Marmots. Final reward is the completed habitat. Where can i find the olympic marmots? wich is the final reward? Page generation time 0.1313 sek.